Sport is life, fun, passion but also business. It is not easy to draw a bright line between sport as an economic activity and sport as a crucial cultural element of society. In Europe, the stakes are prodigious from either perspective. On the one hand, sport represents 4% of the GDP of the European Union; on the other, there are in the EU more than 800,000 sport clubs with more than 70 million members. In numerous ways, the former depends on the latter, giving rise to a plethora of subtle tensions. For decades the EU institutions have struggled with the legal issues that arise from these tensions, and the debate has come to be encapsulated in the complex concepts of the ‘sport exception’ and the ‘specificity of sport.’ Now, the pending Reform Treaty, if ratified, will finally provide a legal basis for a Community action in the field of sport. This new collection of essays presents nine well-informed and insightful analyses of the ‘specificity’ debate from several distinct points of view. The book reprints the papers presented by outstanding academics as well as representatives of the sport world at a conference on the ‘Future of Sport in the European Union’ held at the Catholic University of Brussels in December 2007. The authors examine the legal and political issues related to the latest developments at the EU level, and their impact on the sport organisations, in order to better understand the future of sport and to answer the questions which will inevitably arise from the new situation. economic and social role of volunteering activities in sport. As an analysis of the future directions of EU sport law, this book provides an in-depth assessment of the impact of current policy changes. At a time when a new European treaty is being drafted, and when new questions on sport are being referred to the European Court of Justice, these cogent analyses of European law applicable to professional sport will be of great value to professionals concerned with sport in any of its guises. Note on the Authors. Introduction. 1. The Specificity of Sport from a Legal Perspective; R. Blanpain. 2. Future Directions of EU Sports Law; F. Hendrickx. 3. 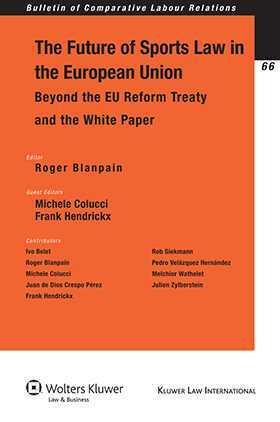 The Future of Sport in the European Union: Beyond the EU Reform Treaty and the White Paper; M. Colucci. 4. Is Sport “Special” under EU Law and Policy? 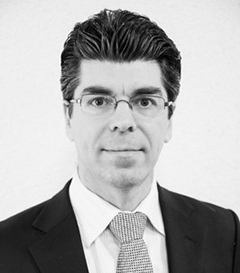 R. Siekmann. 5. Sport Governance and EU Legal Order: Present and Future; M. Wathelet. 6. The European Commission’s White Paper on Sport; P. Velazquez. 7. Football: On the Verge between Social Event and Business Activity; I. Belet. 8. The Specificity of Sport in the EU Policy; J. Zylberstein. 9. The Specificity of Sport in the CAS Jurisprudence; J. de Dios Crespo Pérez. Conclusion. Annexes: 1. EU Reform Treaty (excerpts). 2. European Commission’s White Paper. 3. European Parliament: The Future of Professional Football in the European Union. 4. European Court of Justice: Meca Medina Case.